In 1939 the Post Office Department advertised for bids to fly airmail by autogiro from Philadelphia's 30th Street Post Office roof to Camden, New Jersey's Central Airport. The Post Office roof was ten stories high and about a city block square. Eastern Airlines was the successful bidder at $3.86 per mile. The distance was 6 miles. Five round trips a day were flown six days a week. Kellett was selected as the builder of the autogiro which was basically the same as the KD-1A except that a mail pit replaced the front cockpit. An enclosure covered the rear cockpit. All details of construction were the same as the KD-1A. A very high percentage of scheduled flights were completed. The pilot was Kellett's test pilot, John M. Miller. By act of Congress, all civil air regulations were waived and the operation left to Miller's discretion. The first scheduled flight was July 5, 1939 and the last flight, July 4, 1940. Three hundred pounds of mail could be carried per flight. The KD-1B was granted a Standard CAA Approved Type Certificate under ATC 712. Specifications and performance were almost the same as the KD-1A. In addition to the usual instruments, the KD-1B had: directional Giro, artificial horizon, rate of climb indicator, turn and bank indicator, clock, 15-watt transmitter, three-band receiver, fire extinguisher, and a first aid kit. The only accident in the year's operation was when the autogiro rolled on its side on the roof in very gusty air. It had operated in winds as high as 80km/h. It was not possible to get the autogiro down off the roof for repairs, so it was repaired and test flown from the roof ten stories high. The flying was shared by Paul (Skip) Lukins, one of Pitcairn's flight instructors and autogiro test pilot. Skip was in the KD-lB when it upset on the Post Office. At least one passenger was carried to the roof in the autogiro. Jose Uturbi, popular pianist was flown on one occasion with special permission of the CAA. Only one KD-lB was built. Eastern sold it about December of 1941. It found its way into the author's hands in 1953, after a minor ground accident. The blades and part of the spinup mechanism were damaged. After repair with Kellett's technical help, it was sold to them. They planned to use it as a research aircraft for high speed flight studies. It was designated the KH-17 with a 300hp Jacobs R-755 engine in the nose. It also had two additional 150hp Lycoming engines with the propellers turning in opposite directions mounted in stub wings on either side of the fuselage. It was flown once or twice with only the center engine and without the wings. The project was abandoned because of high control stick forces. The rotor blades used were the front rotor blades from a Piasecki HUP helicopter which was a tandem rotor helicopter. 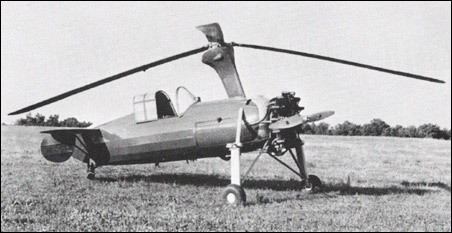 A feathering rotor control system was used instead of the KD-1 type tilting head. Ustedes lo denominan como helicoptero cuando en realidad parece un autogiro .